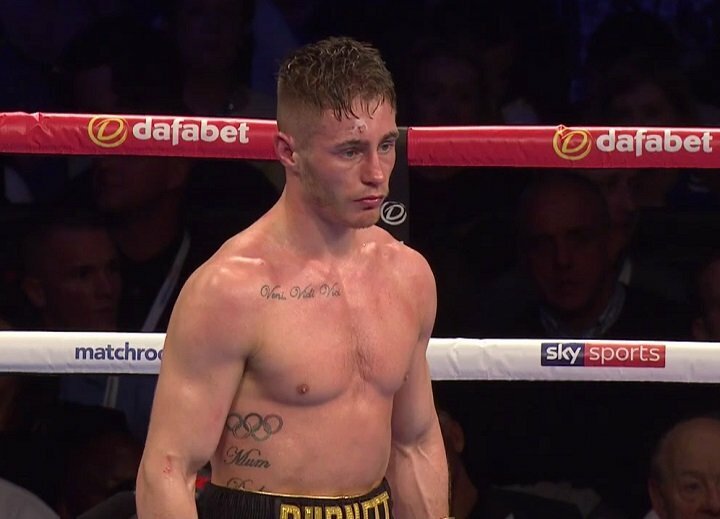 In a big unification match, IBF World bantamweight champion Ryan Burnett (18-0, 9 KOs) came out ahead of Zhanat Zhakiyanov (27-2, 18 KOs) in beating him by a 12 round unanimous decision in scores that seemed far too wide for the fight that transpired inside the ring at The SSE Arena in Belfast, Northern Ireland. The scores were 118-110, 119-109 and 116-112. The fight looked more like a draw than the scores that were turned in by the 3 judges assigned to the fight. If anything, you could maybe give Burnett, 25, a win by 2 rounds, but definitely not 118-110 and 119-109. Those were scores were abominably bad. It’s stuff like this that gives boxing a black eye. The judge that scored it 118-110 for Burnett is Valerie Dorsett from the U.S, and the judge that had it 119-109, Carlos Sucre, lives in the U.S as well. The judge that had it 116-112, Pasquale Procopio, lives in Montreal, Canada. Zhakiyanov appeared to win 3 out of the first 4 rounds. Burnett was holding, mauling and wrestling most of the fight to keep Zhakiyanov unloading with his power shots. Burnett did not look confident that he could win the fight by boxing or fighting. Burnett’s overall plan seemed to be to tie Zhakiyanov up as much as possible so that he could let his shots go, which he did a good job. Clinching is supposed to be used only in special cases, and not as the overall game plan. Tonight, Burnett’s game plan was to hold as much as possible, and that’s what he did. It made the fight very boring to watch. For the most part, the Belfast crowd was quiet, because there was nothing to cheer about due to the holding and wrestling that Burnett was doing. For the boxing fan that remembered the constant grappling former light heavyweight champion Andre “SOG” Ward did in his first fight against Sergey “Krusher” Kovalev last year in November, Burnett did far more wrestling than Ward did in that fight. There was no comparison. There were very few instances were Burnett wasn’t clinching. He would dive forward and grab Zhakiyanov each time there was separation between the two guys. Most of the punches that were landed in the fight were done while the two of them were in clinches. It’s not all Burnett’s fault that the fight ended up being wrestling match instead of a boxing match. Zhakiyanov seemed like he was fine with the holding that Burnett was doing in the fight. Zhakiyanov wasn’t trying to fight Burnett off of him when he would hold. It takes 2 fighters to be involved in a clinch, and Zhakiyanov let Burnett get away with this for 12 rounds. He only has himself to blame for letting Burnett use his game plan of clinching to defeat him. Zhakiyanov’s trainer Ricky Hatton was trying to tell him how to negate Burnett’s holding, but he wasn’t following his instructions. Zhakiyanov was letting Burnett tie him up and stall out the rounds. In the meantime, Burnett made sure that he would land a couple of punches before he’d tie Zhakiyanov up. It was ugly to watch. Burnett is better than this. If this is how Booth is going to have Burnett fighting, then he’s not going to hold onto his titles for very long. Burnett has got to be able to fight rather than hold if he wants to keep his belts.